While there are literally dozens of things to consider when selecting a new garage door. The vast majority can be covered in three steps. Determine which garage door design best suits your home. Remember that even if you are replacing and existing door, you have a wide variety of styles and options to match the look of you home. Use one of the Door Designer Tools listed later in this report to help choose the right style door for your home. A qualified garage door dealer will provide you pricing options and determine the correct door size. Make sure they are and authorized dealer, fully insured, and with a good reputation. Note: Do not try to repair or install a garage door yourself. A Perfect Garage Door for Your House. Today’s garage doors offer a wide variety of customizable features, allowing you to find a garage door that expresses your individual style and compliments your home. How do you find the perfect garage door? • For low-maintenance in any climate, steel doors are the answer. For a timeless, handcrafted look that may require more frequent upkeep, the natural beauty and warmth of wood doors are the classic choice. For a “greener” more environmentally friendly door there are 100% recycled wood composite doors are an option that combines strength and security of steel doors with the beauty and richness of wood doors –without cracking, splitting, rotting or rusting. • Remember, it has to fit. Typically, garage doors are offered in standard sizes. However some manufacturers offer custom-fit sizes for uniquely designed garages. If you have a newer home, more than likely Amarr makes a door to fit your garage. If you live in an older home, you may have fewer choices, but you should have little trouble finding an Amarr garage door that fits. Garage Doors represent up to 30% of what people see when viewing your home. Your new door should create the type of first impression you desire. Work with your home’s architecture and let it be a reflection of your personal style. • Your color options are limitless. Most manufacturers offer a limited number of pre-painted steel doors. But if you want to customize the color, steel doors are ready to be painted with off-the-shelf exterior latex paint. Wood doors come in their natural finish, but are ready for painting or staining to your taste. Wood composite doors come primed to be painted or stained. • The hardware accessories that are available with your garage door will most often depend on the Style of the door you select. 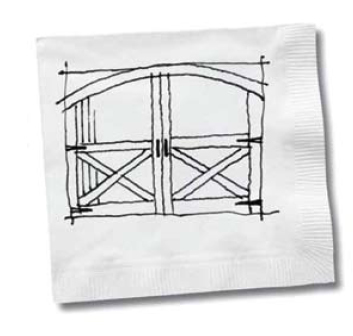 Carriage house doors feature options for decorative handles and strap Hinges. 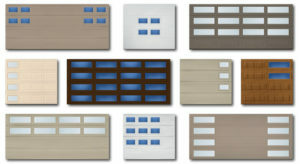 The cleaner lines of a modern or traditional garage door may not need any decorative hardware. • Windows not only bring natural light into your garage, they add another layer of style and sophistication to your garage doors. 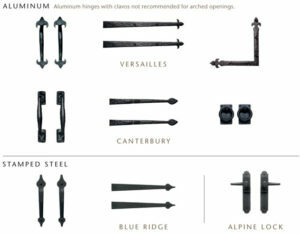 • There are a wide variety of decorative window options from contemporary designs to ornamental faux wrought iron. From Simple insulated to Frank Lloyd Wright inspired colors and patterns. • Window options can create a garage door that fits your style and compliments the design of your home. Knowing the value of your garage door. You need to know the value of the garage door you choose. Certain options are simply going to cost more. But in turn, they may add more value to your home or help you save more money on your energy bill. Determine which features are most valuable to you and which ones you can live without. With all the options available, the perfect garage door can fit your home and your budget. • The price of a garage door is determined by dozens of different variables like size, style and installation. This is why few garage door dealers will quote prices before a site inspection has taken place. Installed doors can cost anywhere from several hundred to several thousand dollars. • Construction materials can vary greatly in price. Generally, stain-grade wood doors are the most expensive, and single-layer (hollow) steel doors are the least expensive. • Architectural elements, like windows or decorative hardware, will affect price. 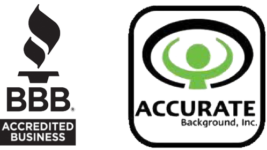 • Today, all Amarr garage doors come with a manufacturer warranty to help protect your investment. In almost all cases, if you have an existing door and track, the old track will be removed and replaced with new track along with your new garage door. A professional garage door dealer can replace your track, in addition to reconnecting your opener, replacing the molding and hauling your old door away. Surprisingly, this does not generally have a big impact on price. Be sure to check with your dealer when they conduct a site inspection. • Heavy-duty steel is the most popular type of garage door because it is durable, reliable, low maintenance and you can paint it to match your home’s exterior decor. Steel doors also have the advantage of being the lowest cost material for a garage door and come in a wide variety of styles. Steel doors also come in three types of construction single, double, and triple-layer. 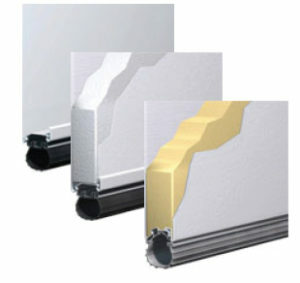 While a single-layer steel door is composed of one layer of steel, a double-layer door will have one layer of steel plus a layer of vinyl-coated insulation for increased thermal protection and quieter operation.A Triple-layer garage door is tough, energy-efficient and offers superior noise reduction. These doors offer polystyrene or polyurethane insulation sandwiched between two layers of Steel. • Wood-Composite garage doors are ideal for those wanting a moderately priced garage door that can be painted to match the home’s exterior. They come primed and ready to paint which means they must be painted. Wood-composite doors are made largely from recycled material, so they are considered more eco-friendly. Wood-composite doors are resistant to warping, peeling and splitting. They are typically priced between steel and vinyl doors. • The beauty of natural wood is undeniable and real estate studies have shown that these doors can increase the value of your home. Wood garage doors come in a multitude of styles and materials. 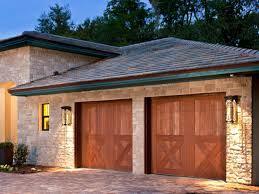 The most common woods used for custom garage doors are hemlock, cedar and mahogany. These doors are more expensive and require a little more maintenance but people buy them because they get to enjoy their beauty every day. • Vinyl garage doors tend to be durable and maintenance free however, they are available in only four colors and can not be painted. 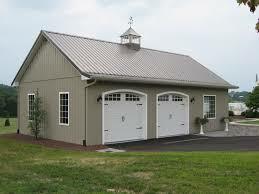 Vinyl garage doors tend to be more expensive than steel. We rarely recommend these doors. • Most Fiberglass doors have an aluminum or steel frame with fiberglass sections. These doors are very lightweight, relatively maintenance-free and are resistance to salt-air making them a good choice in corrosive ocean climates. Fiberglass is a poor insulator and can break relatively easily in very cold environments. • The style of garage door you choose is essentially a matter of personal preference. Your door is a reflection of your personality, and your individuality. Begin by taking the architectural style of your home and neighborhood into consideration. A garage door that compliments the architecture of your home will certainly add to the curb appeal. • Real estate agents indicate that a new garage door can add up to 4% to the homes’ value. • How important is it to you that your garage door be a design element of your home, and/or maximize it’s curb appeal? • How do you plan to use the garage space? – Storage, Workshop, Extra Room, “Man Cave”? • How important is insulation and noise reduction? – Are there living spaces above the garage? • How much upkeep and maintenance are you comfortable with? – ALL Doors & Openers should be “serviced” annually. • How important is the quiet operation of the door and opener? – Belt drive openers are by far the most quiet available. Here are a few additional places to research and learn more.